The season is among us. Some teams had a little warm up last weekend, but real action starts for most this weekend. Let's hear your predictions for your favorite team? Gophers will win the Big Ten and be NCAA Champs. They returned many of the key components from last year's Runner Up team including most importantly Wilcox who is arguably one of the best goalies in the Country. They have some youth coming in at D, which has me a bit concerned, but with that youth we have some size. Nice to have some beef on the back end. Why is it not on tv this weekend? Women's volleyball? That's what I found last year when I looked for a game in November. Wasn't one of the excuses for ruining college hockey more tv exposure and better revenue? Way to go Big 10. I believe 31 of the 36 gopher games are televised. It is lame because it used to be every game with the exception of Michigan tech would be televised. is there any where to listen to the game online, i found a video link but there is no play by play. As a rabid Bulldog fan, I have to ask who the H#[email protected] is Kasimir Kaskisuo and why has he let in 2 of 4 shots? Never heard of this guy, but I see he's from Finland. Hopefully Sandy knows what he is doing. Too bad the game is not on TV. Seems like the Dogs could have a good year, but have really struggled finding solid goaltending since Reiter graduated. 1500 ESPN should have play by play. I'll be at the Huskies game tonight. Raising the NCHC banner. 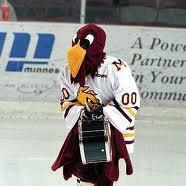 Is it just me, or has college hockey gone by the wayside? Maybe I just don't get any exposure to it anymore. This but kicking by the Beavers over the Sioux might be a good thing? The dismantling of the wcha is what really hurt college hockey regionally. We can thank the big ten for that. All around good showing by the lowly WCHA last night. No doubt that Is the problem. The big ten has to steal every dime every chance they get. College hockey has transphered to the pro level more now than ever. It makes it a lot more fun to watch the NHL. It seems every NHL team has a handful of Americans and several from the wcha/big ten. 6 or 8 years ago I went to a wild game with all the Arena managers across the state. They new their attendance was about to take a dip, they asked what they could do to boost interest from outside the metro. I mentioned not only did they not have any Minnesotans on the team at the time but they didn't have 1 American up with the team. Basically I'm just saying that with some recognizable names to follow from college, makes for good hockey for the viewers. nothing wrong with the wcha. Some good teams but they are going to have a tough time over the next 5 to 10 years. Its sad as the wcha was the best conference in college hockey with the best conference tourney and that's all gone. Now there are 3 different conferences those schools play in and not one of them has sellouts in the tourney. Pathetic. One year they are packing Xcel the next they should have all been playing at a school site. Barring any serious injuries or poor refereeing the Gophers should be the team to beat. Put the bulls eye on them and watch game by game the opponents run at them. Yep gophs are stacked this year at all positions, should be a fun year. St Cloud at Union: No idea, is Union good again this year? Bemidji at Minnesota: Obvious, but how can only 6 teams makeup the BIG 10? Did Bucky need a break already? I don't see them on this weekend's schedule. St Cloud - Need to find secondary scoring, if they do that they'll be tough. Depends on how the younger players develop and if they get a goalie to step up. I think Union lost a lot last year and it NOT the #2 team in the nation. Huskies earned a split at Union but it sounds they switched goalies in the first period the first night. However, 3G on 6 shots then it was probably warranted. I'm cautiously optimistic on St. Cloud. Need to see how they are looking in early Jan.
Wilcox didn't have his best outing last night but gophers still find a way to win. That Bristedt kid is going to be a monster. Dang can he play. Might be the best skater on the team! Gophers vs Huskies on my favorite bow hunting weekend of the year, that bites!! This series is always fun. Wilcox was shaky last Saturday so who knows who shows up there. Gophers definitely have the firepower but these games can really go either way. I don't know if it rings true anymore to the extent it used to but even though I went to the U I like that some of the Husky players were passed up by Lucia and have a chip on their shoulder and come out to prove a point and have come through quite a few times. I still want the Gophers to win but really don't mind when the Huskies come through. Like said great series that in a short amount of time has really made and Gopher Wolverine Little Brown Jug game pale in comparison, great rivalry.